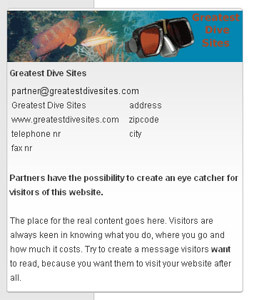 Dive shops, liveaboard boats and charters can login and start creating their own advertisement for GreatestDiveSites. This ad will be displayed at many different spots at our website. And best of all, our basic account is completely free of cost. Would you like to be listed at these places for free? EXAMPLES: Our PartnerLink and corresponding PartnerBox. Partners have the possibility to create an eye catcher for visitors of this website. The place for the real content goes here. Visitors are always keen in knowing what you do, where you go and how much it costs. Try to create a message visitors want to read, because you want them to visit your website after all. 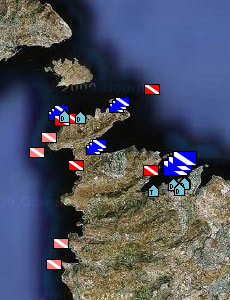 You can design your own ad and choose at which dive sites it will be shown. Your ad will also be shown at our linkpartner page, Google Maps coordinates page and we randomly show your ad at our homepage. Your changes are updated immediately. Take a look at our page All features for a description of each one of the different features we offer. We give you the possibility to improve your website by using our dive sites and all the information we have about it. This is done by placing an iFrame at your website. You can change colors and many other settings to fit your websites design perfectly. Become our partner now and email us at with your websiteurl and name. Use the subject british-virgin-islands.greatestdivesites.com:OKE as we have a very strict spam policy. We will contact you as soon as possible and provide you with a login and password. With those you can start creating your PartnerLink, PartnerBox and GooglemapsLink, which will be online immediately. All what we would like to have in return is a reciprocal link at your website. Try to place our link where it cannot be missed, because the more incoming links we get from you the more features out of our basic partnership you will get for free. Take a look at our links page for banners and animated gifs.